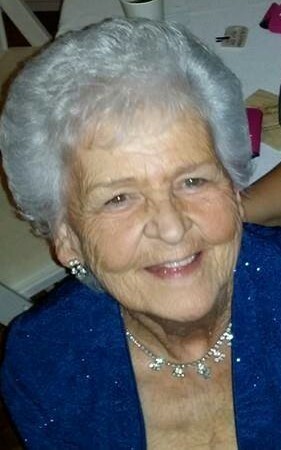 Nan "Neena" L. (Pierce) Dionne Lifelong resident of Whitman passed away October 20, 2018. She was 81. Wife of the late Walter T. Dionne. She is survived by her children Noreen Dionne-Henshaw of East Bridgewater, Valerie Dionne of Whitman, and Jessica Dionne of East Bridgewater. Sister of David Pierce of Whitman, Gerald Pierce of Avon and the late Rita Forbes, Harold, John, Larry and Ann Pierce, and Judy Douglas. Grandmother of Corrie, Kelly, Ellen, Erika, Rachael, and the late Dylan. Also survived by her great-grandchildren Ryley, Nathan and Abel. Nan was a communicant of Holy Ghost Church, in Whitman, and an all hours participant of Perpetual Adoration. She was a friend of Bill W. Nan loved spending time with her family especially her children, grandchildren and great-grandchildren, she will be greatly missed by all. Relatives and friends invited to attend visiting hours in the MacKinnon Funeral Home, 760 Washington St., Whitman on Thursday Oct. 25th 4-8 pm. Funeral Mass Friday in Holy Ghost Church at 9 am. Burial to follow at Fern Hill Cemetery in Hanson. In lieu of flowers donations may be made to; Memorial Fund for Nan Dionne for Friends of Whitman Park, C/O Mutual Bank, 570 Washington St., Whitman, MA 02382, To gather funds to sponsor a tree in her memory .